Pauline Faivre, Caroline Giroux-Huppé, Anne Bourhis, Lamiae Senhaji and Marianne Frigault. A team of Master’s-level students representing HEC Montréal pulled off a brilliant success in the International Graduate Competition, held in Montréal from April 28 to May 3, 2018. 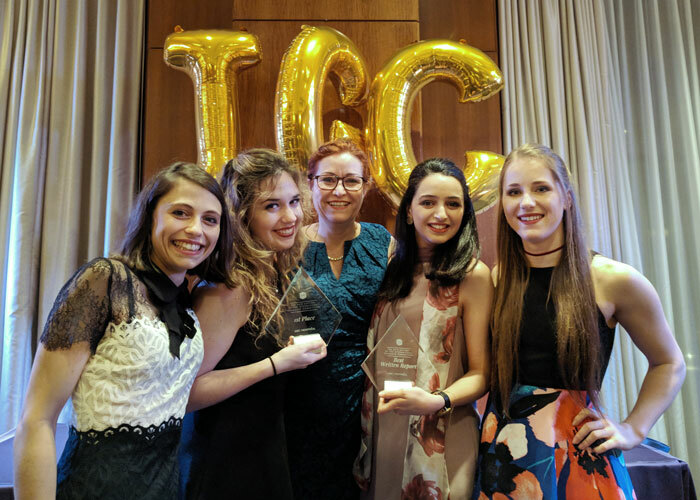 The School’s delegation of Pauline Faivre, Marianne Frigault, Caroline Giroux-Huppé and Lamiae Senhaji not only took first place overall, but also won the award for the best written report. The teams, from all over the world, had 48 hours to solve a multidisciplinary case. This year, they had to come up with a strategy for the city of Montréal to become a “smart city,” taking account of international, technological and financial considerations. The four winning students were coached by Professor Anne Bourhis (Human Resources), with the support of Professors Jacques Lemay (Finance), Marie-Claude Trudel (Information Technologies) and Gwyneth Edwards (International Business), as well as alumna Valérie Grenier-Paquette (MSc 2016), who had herself taken part in this competition before.